Touch The Spider! : The same old old-school groove, now also with gloom! 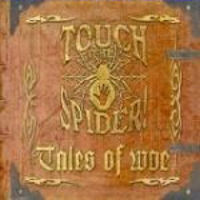 'Tales of woe' is Touch The Spider! 's third album, yet they refuse to let their music grow apart from the 70's proto doom/hard rock school that they worship. Normally this would have led me to moan about unoriginality and lack of a personalized sound, but on Touch The Spider! 's last two albums that hasn't bothered me the least. To me it sounds like these guys might as well have existed side-by-side the old deities of the subgenre, forging their own path based on the same influences that the other deities did. It sounds like... A reinveintion of proto doom! And this time I feel comfortable calling the release a proto doom album. 'Tales of woe' is heavier and gloomier than its predecessors, churning out riffage worthy a place amongst 'Pentagram'/'Relentless', 'Black Sabbath', and 'Master of Reality'. The most post-modern-sounding parts of the music are those which remind me of Dream Death (who had their prime in the late 80's). Clearly, this is for fans of the oldest school. Overall I'd claim that this release is a victory for the band. Not only have they outgrown the sound of its predecessor in terms of doomyness, 'Tales of woe' is clearly also the catcher of the two albums. Songs like 'It's coming ... alive', 'Death is my destiny', and 'Burn me' are as memorable as you'd expect from a release which is to become a classic in its own genre. There is only one catch, this is a very mature release with a little less youthfulness than you might expect. Thus you'll still need to spin it at least thrice before it really starts to grow on you. Duration : Approx. 43 minutes. Visit the Touch The Spider! bandpage.